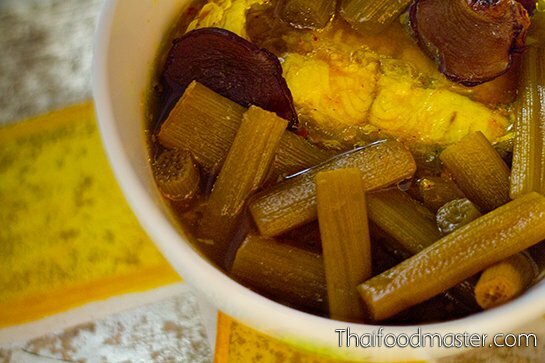 The curry’s sourness is provided by Asam Gelugor and tamarind paste – sometimes fresh tamarind is used – with the addition of lime juice, just before serving, for an overlay of fresh citrusy sharpness. Blessed with the longest monsoon season, Thailand’s south is fertile, with breathtaking nature that embraces mountains, forests and tropical beaches. 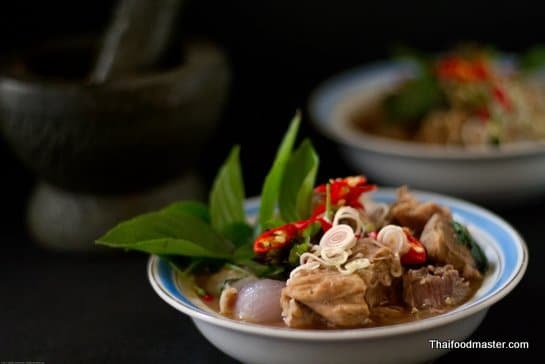 Southern Thais like their food to be charismatic; fiercely hot, with clear and strong pillars of flavors. They do not care for reserved flavor layering, and their bold food is renowned as the country’s spiciest. 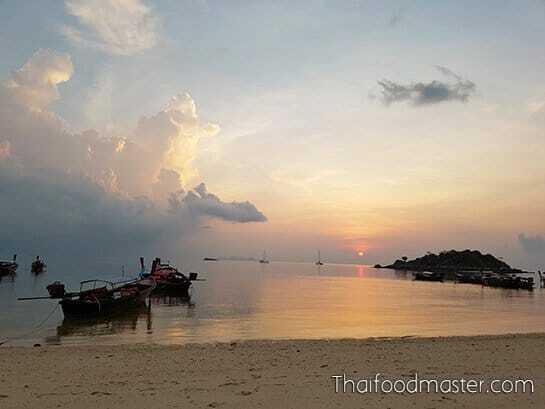 And no wonder: the region’s roads are stained gold from extensive use of turmeric; flurries of black pepper dust storms, the unmistakable scent of the day’s seafood catch, and the intense aromas of fermented shrimp paste and sun-dried fish infuse the air. 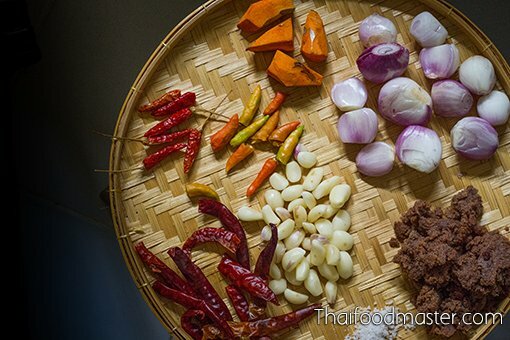 Unlike the food from Thailand’s central plains, where three flavors are popular, the southern palate prefers a dynamic duo of fiery-spicy and sour, hot and salty flavors, or even spicy and bitter. A typical meal will almost always include a type of curry or a soup; if not, a chili relish is a must. 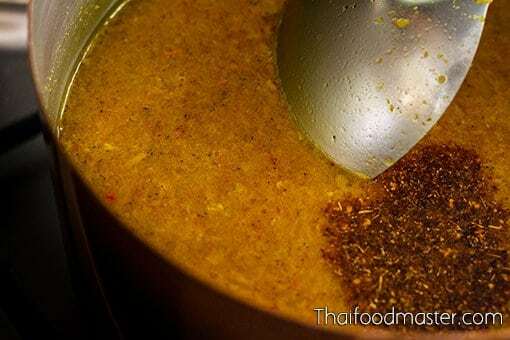 And, unlike the curries of the central plains, southern Thai curries do not utilize fingerroot (krachai กระชาย), coriander seeds or cumin seeds in their curry pastes. 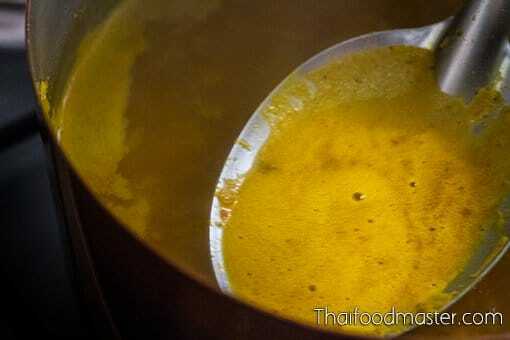 Fresh turmeric is a predominant ingredient in Southern Thai cuisine. 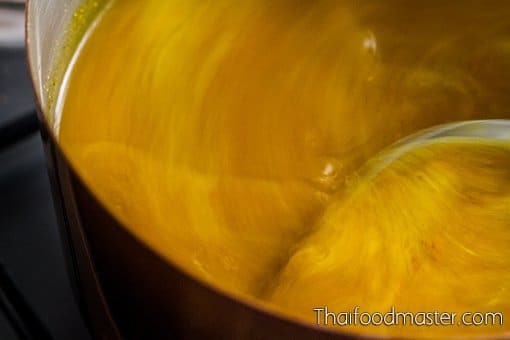 The Indians and Chinese have praised turmeric for millennia – for the southern people of Thailand, turmeric was considered to be the king of spices, an antidote (yaa gaae yaa, ยาแก้ยา or phayaa yaa, พญายา) for treating black magic spells that manifested as spiritual or physical ailments. Turmeric is still used as a remedy for a wide range of conditions: today, we know that turmeric contains the chemical Curcumin, which has the properties of a strong antioxidant and anti-inflammatory agent and pleasantly euphoric side effects. 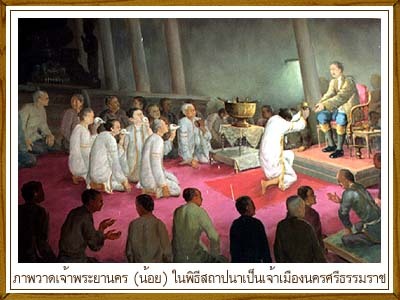 Recognizing the strategic importance of the peripheral settlements in the south, the central governances of Siam, and even the Ayutthaya kingdom, dispatched family members or trusted nobles to manage the region from southern bases, especially in Nakorn Sri Thammarat province where the provincial governors held the title “jao phra yaa na-korn, (เจ้าพระยานคร ฯ). 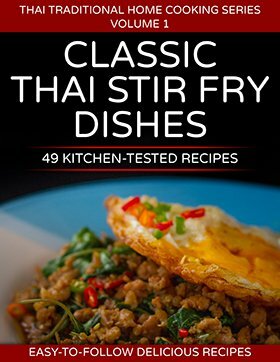 This opened a culinary channel by which southern food influenced the palace and central Thai cuisine. HM King Rama V invited the daughter of the provincial governor at that time to the court of Siam as his consort, giving her the duties of looking after dining and household tasks. The King also directed the provincial governor of Nakorn Sri Thammarat province to send cooks from the south to train the staff of Dusit Palace in southern cuisine. This was the path of entry to the royal court for southern dishes such as fermented fish innards curry (gaaeng dtai bplaa, แกงไตปลา), fermented fish innards salad (dtai bpla sohng khreuuang, ไตปลาทรงเครื่อง) and yellow sour curry (gaaeng leuuang, แกงเหลือง) . The curry paste can be as simple as chilies (both dry and fresh), shallots, garlic, fresh turmeric and kapi, as described in this recipe; in some versions, lemongrass and galangal are added. 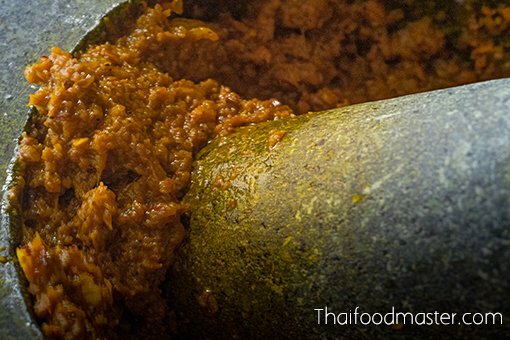 Rule of thumb: The ratio between the curry paste and the fermented shrimp paste (kapi) should be at least half in volume kapi to curry paste. Season the curry before cooking: Dissolve the curry paste in the water (or stock), and season it with tamarind, fish sauce and just a bit of palm sugar. 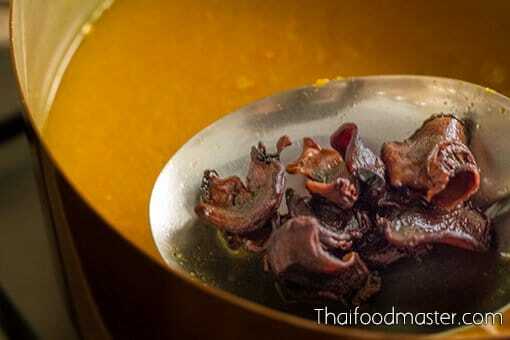 You will be able to get a better sense of its saltiness and sourness; tamarind sourness is relatively heat resistant, and it won’t change significantly in cooking. 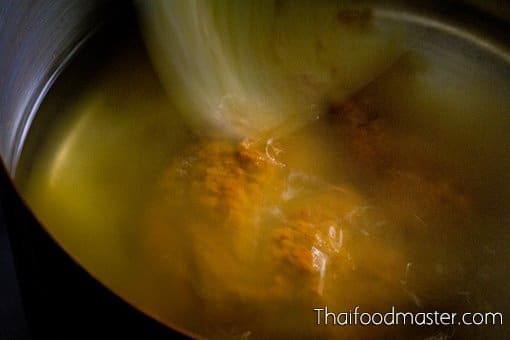 If you season the curry while it is still hot, the heat, spiciness and the fresh turmeric bitterness will mask the actual flavor profile. The target is for a dominant sour flavor followed by saltiness. 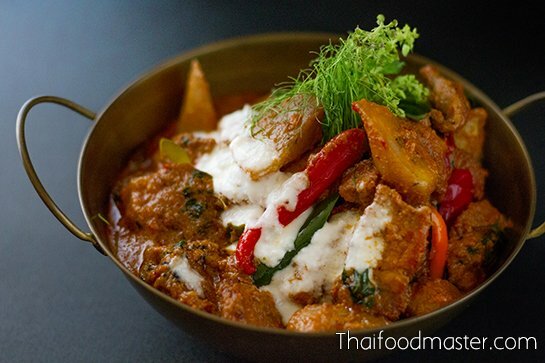 It should be very spicy – so make it as spicy as you can handle, the spicier the better. 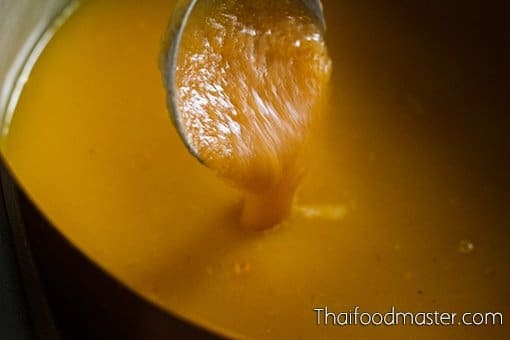 It is preferable to use southern Thai products such as fermented shrimp paste (kapi) and fresh southern turmeric, which has a better color and less bitterness. 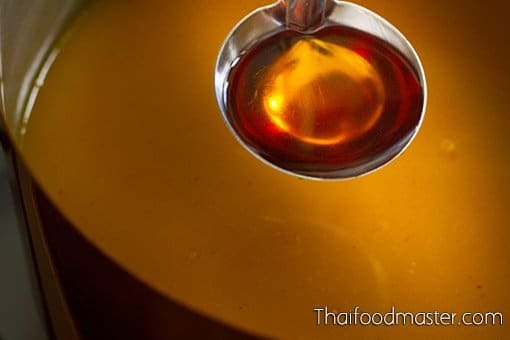 If you have access to southern sugar (naam dtaan waaen, น้ำตาลแว่น), which is made from the sap of the sugar palm tree (Asian Palmyra palm) and sold in the shape of small round disks, the curry will have even more of a southern-style home cooking taste. 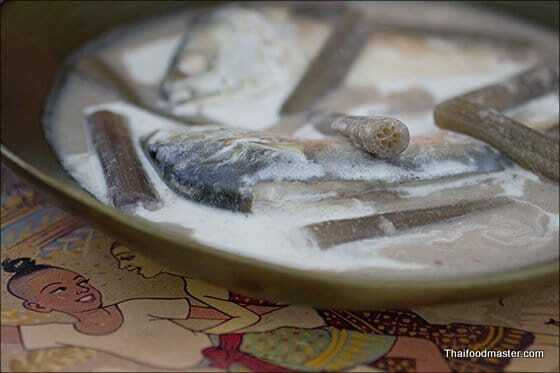 You can add cooked fish meat, and even salted threadfin fish meat, to the curry paste; to thicken the curry in the first case, or to add another layer of umami and saltiness to the curry in the second case. 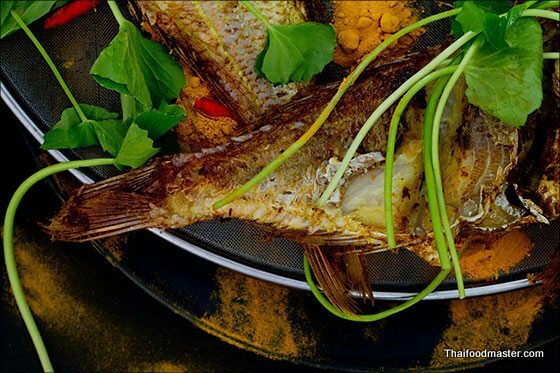 Serve with fried steam mackerel, Thai crispy omelet, salty beef jerky (neuua khem, เนื้อเค็ม), lightly salted and deep-fried snakeskin gourami fish (bplaa sallit ปลาสลิด), sun-dried snakehead fish, sun-dried squid etc. Prepare the curry paste ingredients: peel the shallots and garlic, and scrape the peel of the fresh turmeric. Use both fresh and dry chilies, preferably of different varieties to create a more complex chili flavor, hat and aroma. Use high quality fermented shrimp paste. Pound all the ingredients using a pestle and mortar, starting with the chilies and salt, into a consistent paste. Mix in the kapi. 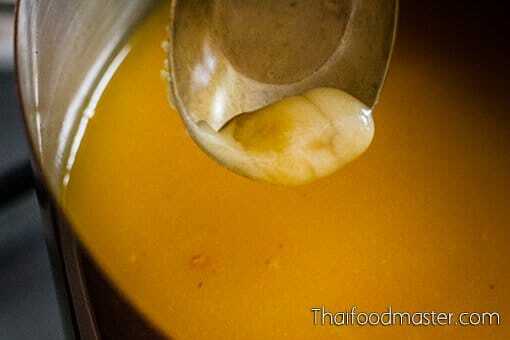 Dilute the curry paste in simple fish stock or water. Add Asam Gelugur, and start boiling the curry. When the curry is still lukewarm, season it with palm sugar. Mix well and taste, adjusting as needed. The curry should be spicysour and salty, with a faint sweetness, and a pleasant bitterness from the turmeric. Let the curry boil. While cooking the curry paste, don’t rush to skim off the crust that forms or you will lose flavors; wait until the curry is cooked before skimming. Add an extra dose of ground dry chili powder we want it really spicy! 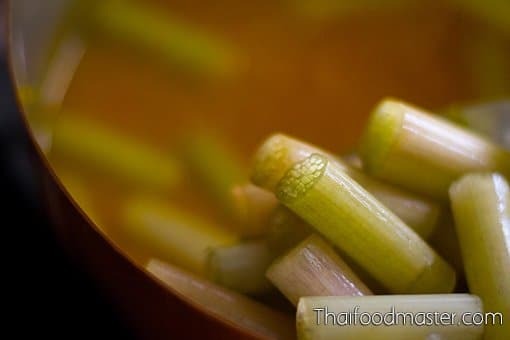 Add lotus stems, cut into 2.5 cm (1”) slices. A couple of minutes later, add the thicksliced fish, ensuring that the fish is at room temperature. 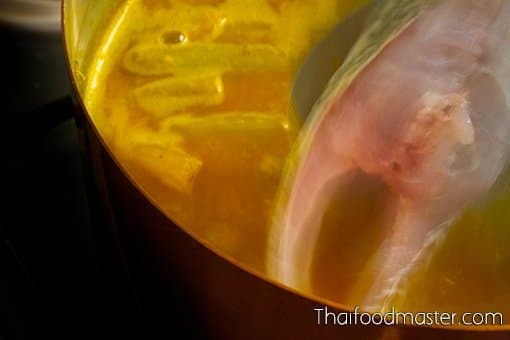 Immerse the fish completely into the curry broth and make sure that the broth is boiling – this will prevent a fishy odor. 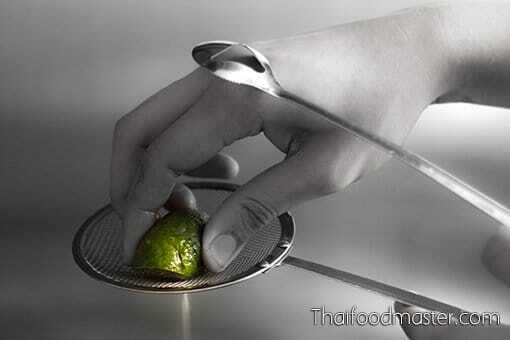 When the fish is cooked, turn off the heat and squeeze in a generous amount of lime juice. Serve along with fried steam mackerel, Thai crispy omelet, salty beef jerky (neuua khem, เนื้อเค็ม), lightly salted and deepfried snakeskin gourami fish (bplaa sallit, ปลาสลิด), sundried snakehead fish, sundried squid etc.